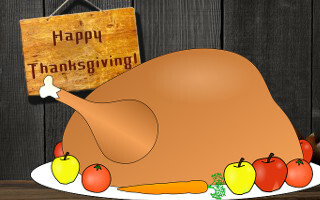 Thanksgiving is a holiday that we always eager to spend with our families and friends. Leaving your homes empty you need to follow few simple tips to make sure your family is safe this season. Don’t post your holiday travel plans on Facebook and other social networks. You don’t want to inform the whole world that your home will be unattended. Ask some of your neighbors to come pick up your mail deliveries or make sure you canceled it for the holiday time. Mute your phone ringer and make sure your answering machine is not saying that you’re away (better say something neutral, like ‘Hey, I’m busy at the moment, please leave a message!’). Set a timer to operate lights. Never hide your keys outside, keep in mind that burglars know all the ‘good’ secret places. Have video surveillance installed in your home. This way you will be able to monitor what is going on in your house when you are away. Moreover you can get event-triggered or motion-triggered notifications by SMS or by e-mail. Following these simple Thanksgiving recipes will ensure your holidays will not be interrupted by restless thoughts about the safety of your home. Have a safe and happy Thanksgiving!